A.P. 2019E (Amended). Pilots's Notes. Original copy dated 5/44 (amended to 1/47). 40 pages with pullout diagrams/photos. Covers a general description of the aircraft including fuel and oil systems; aircraft controls; engine controls; operational controls including bomb doors and gun controls etc. Part II deals with handling, part III - operating data for the Merlin 21 and Merlin 23, 25, 225 engine, Part IV - emergencies - includes engine failure, feathering, parachute exit, ditching, bomb jettisoning, crash exit etc. Finally part V has illustrations of the cockpit, instrument panel etc. 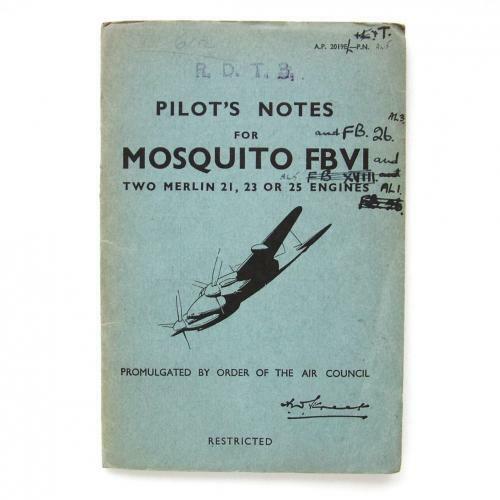 The cover is quite clean but has been annotated with updated aircraft type and engine data. The inner pages are good and have numerous amendment sheets glued in place along with some handwritten annotations. Good '+' used condition. Stock code P21183.